Nestled between houses, snaking through ivy and often rising high above the street, the public staircases of Portland are fun and funky hidden passageways in the city. Public stairs exist all over the world, and aficionados eagerly catalog and explore as many as they can. The stairs here in Portland are sometimes magical portals into another world. Spanning from St. Johns to Crestwood, Mt. Tabor to Roseway, there are public stairs all over the city of Portland. They’re Just Stairs, What Makes Them So Special? Often tucked away, these public staircases are an escape, ever so briefly, from the bustle of city life. In some cases, they provide a shortcut from one location to another, a jump between vastly different elevation and maybe even a portal to an entirely different neighborhood. That’s the case with the stairs from OHSU along Terwilliger down to Lair Hill. In this neat little section, a combination of paved trail, grassy path and stairs allows you to descend down the steep hillside, shaving off a half mile of travel along a busy road. Cars can’t get through here - only those who are adventurous enough to venture on foot. But a journey along the stairs is about more the simply taking a shortcut. On the Terwilliger stairs, you’ll delicately pass through backyards, dead end streets and alongside gardens. The stairs are maintained by volunteers and the residents don’t seem to mind the occasional almost-in-my-yard stranger; it’s rare to run into anyone else on the stairs in this isolated area. On SW Broadway Drive (where SW Broadway ends at I-405), if you’re not looking closely you may overlook the staircase in the trees. This gorgeous set, pictured below, is part of a looped urban hike known as the Elevator Stairs. One and a half miles of closed-off streets, quiet roads and stairs surrounded this unique area high up on the hill overlooking PSU. Climb to the top for striking views of the city, particularly gorgeous at night. When you climb the stairs, it’s easy to feel as if you’re sneaking around, getting away with something. Though the stairs are indeed public, they often twist along side yards and offer glimpses into the older homes of Portland. Many of the staircases stretch out under the dense canopies of ancient trees. They may afford broad city views, but more likely they allow only sneaky peeks through the trees, like a kid peering out from a tree fort. Catapult your mind from the cares of the world into another realm, a chance to relax for a moment and settle into the world that immediately surrounds you. Most of the stairs are extremely steep; they were installed to help walkers get from one elevation to another via the most direct route. As you can see from the photos, most are are not for the faint of heart and will take a bit of effort to ascend. If you’re looking for a quick workout, a few stair repeats are an easy way to pack it in. Whether you’re walking or running, you’re sure to get your heart rate up. An excellent interactive map of local stairs. Locally published by Microcosm Publishing, this book highlights 18 distinct adventures that encompass 142 staircases and hidden paths within the city. 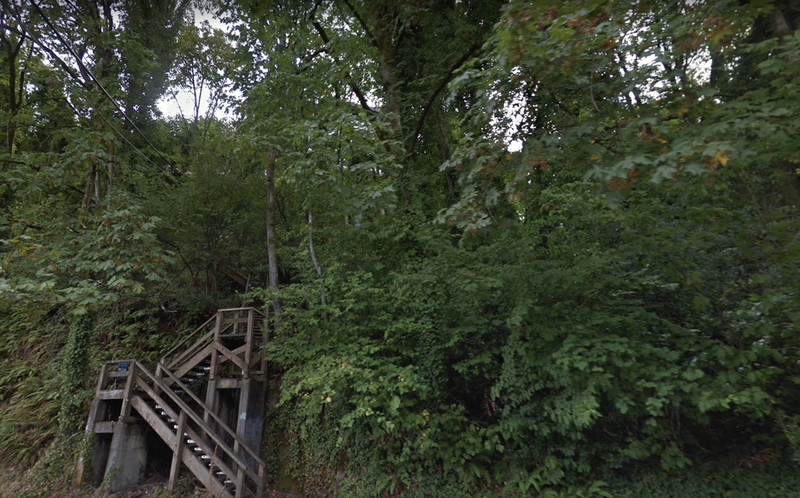 Some stairs also pop up on Google Maps. Each of the staircases is maintained differently. The wooden ones may be slick when wet, and handrails aren’t always available. Use caution and walk the stairs at your own risk. It’s rare to encounter anyone else on the stairs but if you do, common trail etiquette applies. One of the best aspects of the Portland stair walks is that they are not a big commitment, just a momentary sigh of relief combined, perhaps, with a little huffing and puffing.